Expert (known as Normal in the British English version) is the second course in the demo version of Puzzle & Dragons: Super Mario Bros. Edition, unlocked by clearing Intro once. It is a basic, underground level. When the player selects this course from the menu, the game provides a tutorial of the battle mechanics. 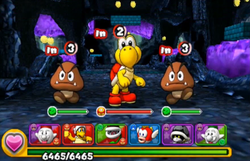 In Expert, players can choose between two teams consisting of either Boo Mario (level 30) and a Fire Bro, a Fire Piranha Plant, a Cheep Cheep, and a Bony Beetle (all level 25); or Ice Luigi (level 30) and a Green Koopa Troopa, an Ice Bro, a Blue Magikoopa, and "Red Koopa Troopa & Cheep Cheep" (all level 25). The player's helper is the other brother, but with the same power-up as the one they selected. 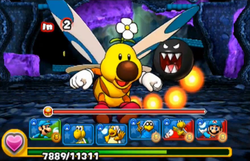 This level is straightforward, consisting of six battles: the first battle has two Goombas and a Red Koopa Troopa; the second has two Red Koopa Troopas and a Piranha Plant; the third battle has four Buzzy Beetles; the fourth battle has two Spinies; the fifth battle has a Big Paragoomba; the sixth battle has a Fire Bro and an Ice Bro; and a boss fight at the end with Flutter & Flame Chomp. The player has only Fire, Water, Wood, Dark, and Heart Orbs on the Orb field. The boss battle of Expert. This page was last edited on April 10, 2019, at 11:34.